From designs that tamed the American wilderness, landed on the moon, and defended the country, Case knives have earned their place in some of our nation’s defining moments. Yet after 130 years, this iconic brand had never sold a knife online. It was our job to build their first-ever ecomm site from the ground up. 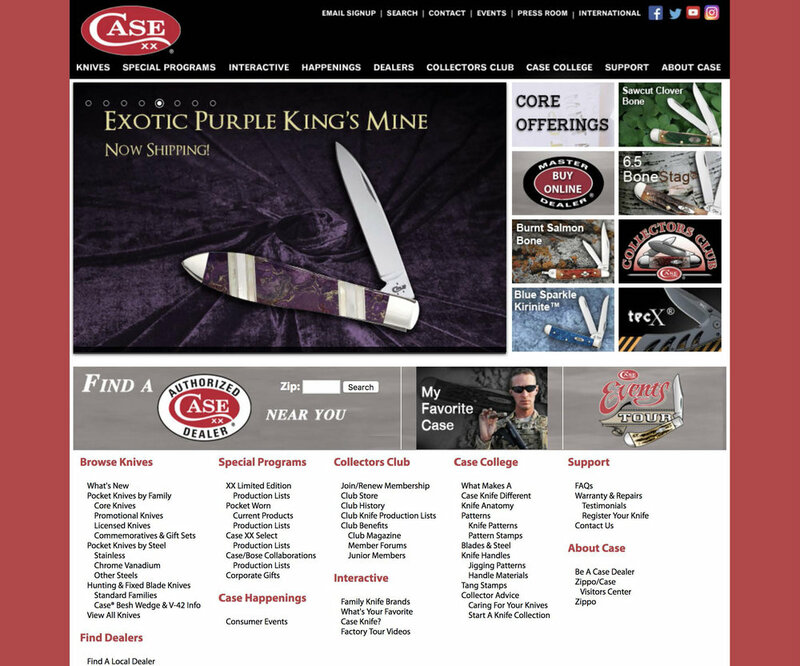 Case knives finally wanted to sell knives online to a younger audience to compete with the likes of Amazon. With a small, dedicated team, we built from scratch an ecomm site with a product database for over 600 products, while creating messaging and imagery to reposition the Case brand. And, because Case couldn’t compete with Amazon on price, we gave users the ability to personalize their knives. They needed to redo pretty much everything about their existing website. Built in 2006, it had no visual hierarchy, confusing and redundant navigation, links to PDFs, and most importantly, lacked e-comm. We went to work interviewing knife owners, checking out the competition, building personas, finding a place for the 600+ products in the IA and developing a content strategy. 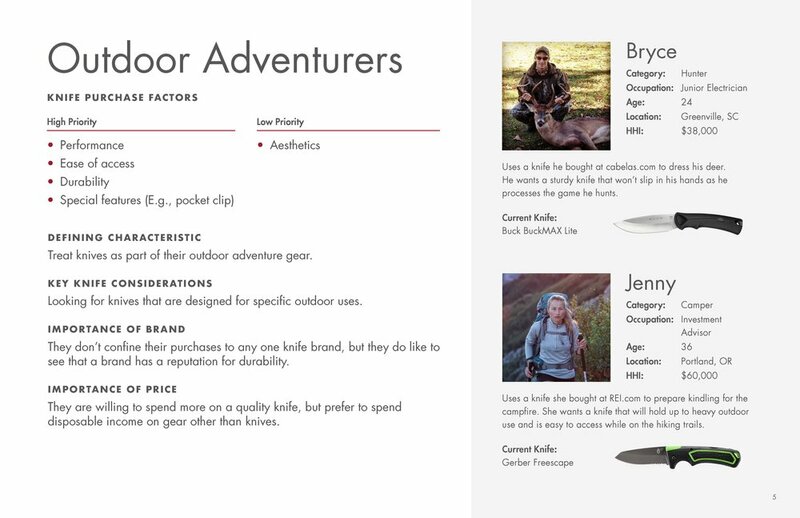 We built the product category and detail pages to educate a range of personas on the different types of knives and their use cases. And to move differentiate Case from other knife makers, we shot imagery that gave better context to the knives, and brought to life a new brand position. We told the long, rich story of the knife company and its place in the history of America. 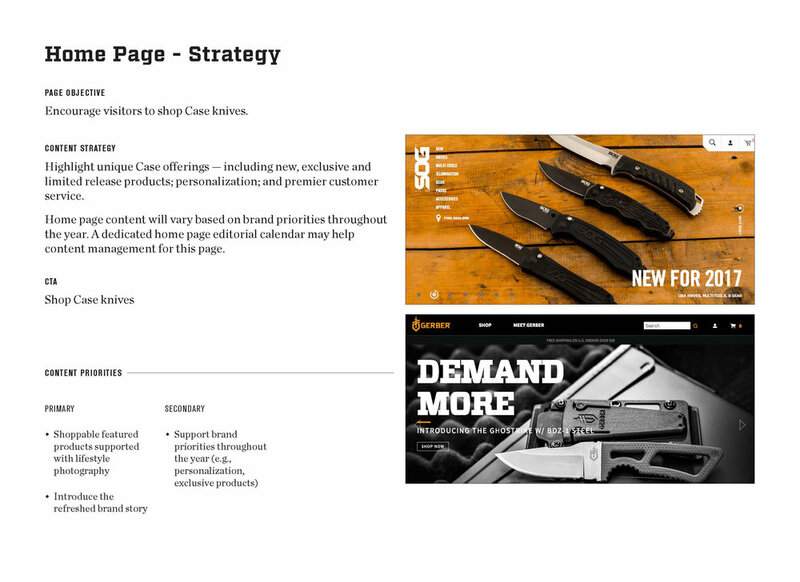 We also created content to help people take care of their knives and resources for collectors.